Fresh orange juice and zest brighten this beautiful Chinese dish, which is full of colorful vegetables and seasoned with garlic, ginger, and soy sauce. Prep all the ingredients before you begin to cook to ensure that the vegetables and chicken are properly cooked. 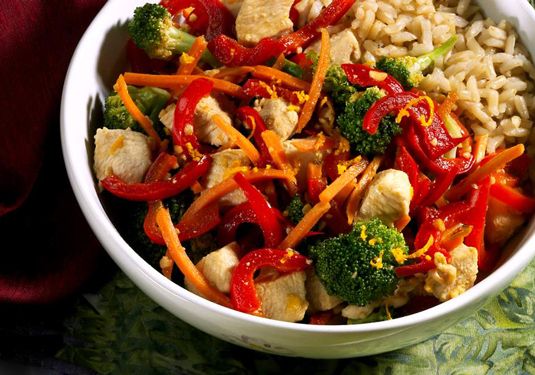 Serve over brown rice for a satisfying flat-belly meal. Marinate the chicken breast in 1/2 the orange juice and zest, and 1 tablespoon of the soy sauce for 10 to 15 minutes. Heat a wok or large skillet over high heat. When hot, add 1 teaspoon of the sesame oil and swirl to coat the bottom of the pan. Add the chicken and marinade to the pan, cooking until no longer pink and cooked through, about 6 minutes. Remove the chicken from the wok and set aside. Reduce the heat to medium-high and add the remaining teaspoon of sesame oil to the pan. Sauté the garlic and ginger until fragrant. Add the pepper, carrots, the remaining 2 tablespoons of soy sauce, and the vinegar to the wok and cook just until the vegetables are tender. Stir in the broccoli florets and cook until bright green and gently steamed. Remove the vegetables from the wok and combine with the chicken mixture. Serve immediately. Per serving: Calories 220 (From Fat 51); Fat 6g (Saturated 1g); Cholesterol 73mg; Sodium 922mg; Carbohydrate 14g (Dietary Fiber 3g); Protein 29g.